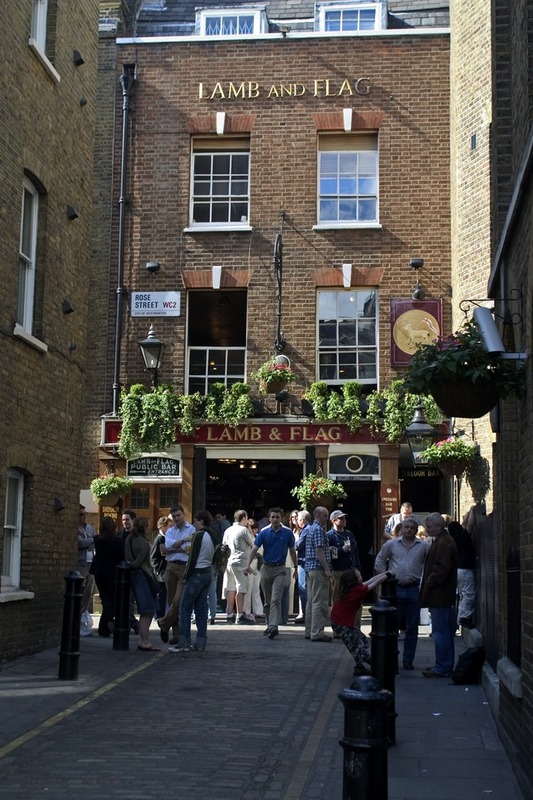 One of the oldest pubs in London, the Lamb & Flag was once known as the Bucket of Blood, thanks to the bare-knuckle fights held here. As you step inside the narrow pub which habitually bursts at the seams with hoards of local workers and shoppers - it's easy to imagine a time when this place was filled with London's rowdy residents jostling for space at the bar or packing out the ancient settles. A noticeable lack of chairs and tables downstairs results in drinkers thronging in front of the bar or squeezing into nooks and crannies much like they would have done when it was first opened. If you want a bit of space, fight your way through and wind your way up the creaking staircase to a larger roomier upstairs bar named the Dryden Bar, after the poet who was allegedly attacked in the alleyway next to the pub. Alternatively, if it's sunny, head outside where an area of pavement is usually roped-off to create a sociable drinking paddock. Bare-knuckle fighting may have given way to mobile phone baiting but, when its packed out (as it invariably is), you get the feeling not much has changed over the centuries. Claiming to be the oldest pub in London this is truly the place to come to experience a taste of what traditional London pubs are, and were, meant to be. Come expecting atmospheric jovial crowds, a strong sense of history, real ales, a narrow bar, oak beams and low ceilings and you wont be disappointed. Creaking staircase and narrow rooms, bustling drinkers and wooden benches, real ales, history, fireplace and ancient settles. The best pubs near London Lamb & Flag. Lamb & Flag clubs, bars, cabaret nights, casinos and interesting nightlife. What are the best dining options near Lamb & Flag London? Lamb & Flag gyms, sporting activities, health & beauty and fitness. Where to have your meeting, conference, exhibition, private dining or training course near Lamb & Flag. From cheap budget places to stay to luxury 5 star hotels see our deals for Lamb & Flag hotels, including Radisson Blu Edwardian Hampshire Hotel from 89% off.